The East Campus Housing Community opened Fall 2017, and is located on the northeast corner of the campus. It is a distinctive student neighborhood that is home to 154 student residents with sophomore, junior, or senior standing. The East Campus Housing Community provides all of the conveniences of on-campus living, while also providing an atmosphere that assists students in transitioning to off-campus living. While the apartments and small houses come furnished with furniture and appliances, students are responsible for their own cleaning supplies and small kitchenware. 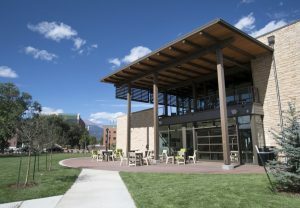 The East Campus Housing Community consists of eight residential facilities and the Hybl Community Center, which features a large gathering space, smart classroom, west-facing deck, and a laundry facility. Additionally, the new East Campus Housing Community is home to the Hershey Courtyard, which has an outdoor hammock garden, grilling space, and an outdoor gas fire pit that can be enjoyed year-round by residents. There are a variety of living arrangements and options in the housing community: two nine-person apartments, 13 eight-person apartments, and two 16-person small houses.